Below are some of our frequently asked questions regarding our Fine Art Canvases & Framed Prints, but don’t hesitate to ask your own! Why should I order these items from you when I can get them cheaper somewhere else? This is probably the question we get asked most often. We have to start by saying that we cannot guarantee the quality of your images or products whenever they are purchased elsewhere. When choosing our vendors, we look for the highest quality products for our clients. Period. All of our products come with a lifetime guarantee! Our canvas company uses only the best quality canvas, fine art papers, stretcher bars, K3 ultrachrome inks, and UV coatings to ensure that your art will be around for generations to come. Each canvas must pass a very strict 4-step quality assurance process. And it comes ready to hang, which we love! Our frame line is based on simplicity and ease. 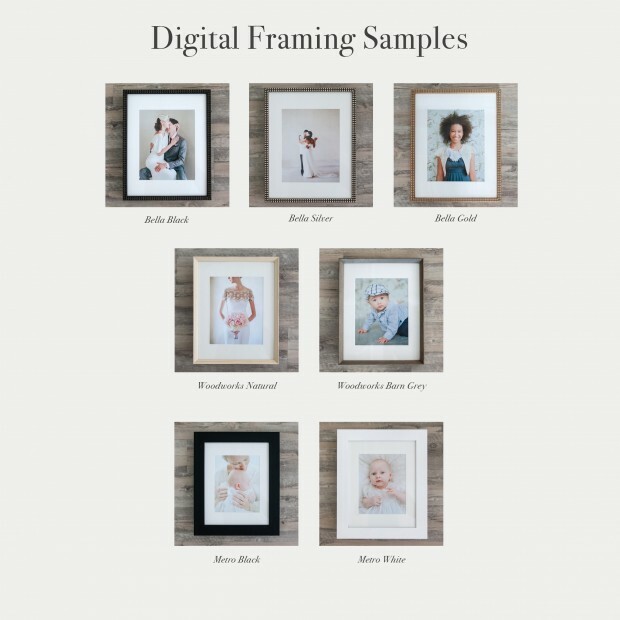 We’ve curated our collection to three essential frame styles, available in a variety of gorgeous finishes and standard photography print sizes. Our frames are sleek enough so that your image remains the focus. And they’re super easy to hang and change out your images in the future (if you choose to do so). Should I choose a canvas or a framed print?! Another great question! While you can make any image from your session a canvas, we believe that certain images lend themselves better to this form of art. A fine art canvas is permanent. It cannot be changed out like a framed portrait, making it an incredibly special & beautiful family heirloom. This is really a personal preference, but we are happy to discuss it with you further depending on the image(s) you are interested in and where you think you will hang them. Regardless of what you choose, you can feel confident knowing that you are making a beautiful investment for your family. Do the framed prints include matting? Absolutely! Classic, acid-free mats are included with your frame purchase. These mats can also be removed for the look of a larger, full-framed image. *Please note: Our 10×20 panoramic frame does not include a mat. Do you ever have sales or promotions on these items? Yes! Occasionally we receive special promotions from our vendors and love to pass those on to you! If you are interested in one of these items, let us know and we can keep an eye out for any specials! Shipping must be expensive for these types of items. Is it included in my investment? Yes, shipping is included in the investment price. However, we do have to add sales tax to any products purchased through our studio.